January 24, 2014, Sunrise, Florida - Sonic Reality sound development company has teamed up with legendary producer/engineer Hugh Padgham, known for recording top albums in the 80s with artists like Phil Collins, Genesis, The Police, Sting and more. In this new sample library series, together with Sonic Reality producer Dave Kerzner, Hugh is recreating iconic drum kit sounds in the studio using the same mics and equipment he used on classic albums such as Peter Gabriel’s 3, Phil Collins Face Value, Genesis Abacab, The Police Ghost In The Machine and more! 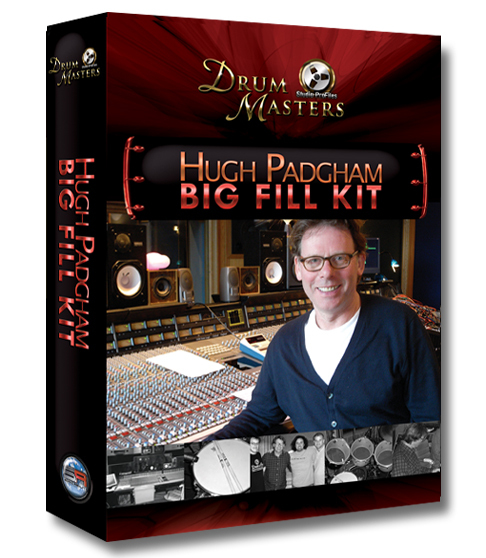 The first release in the series is the Hugh Padgham “Big Fill Kit” made for FXpansion’s popular BFD software. This is a BIG single head 7 tom Premier drum kit sampled in the stone live room of “The Farm”, a studio that belongs to the band Genesis and a place where countless hit songs have been recorded. This new session decades later was done with the same SSL® mixing console Hugh used in the 80s and captured with the same microphones including the infamous “Ball & Biscuit” mic which was a signature element in the discovery and original creation of the famous “big fill” drum sound heard on songs like “In The Air Tonight” by Phil Collins and “Intruder” by Peter Gabriel. "A lot of people have asked over the years how one can get this big huge drum sound from songs like "In The Air Tonight" and others I recorded with Phil Collins, Genesis and Peter Gabriel in the early 80s.” says Padgham “It s due to a combination of many things besides the way it was played by the drummer. Sonically this sould include the sound of the single head 7 tom drum kit in a stone live room, the microphones along with their placement and the way I processed them with the SSL. I remember the details of these sessions and have talked about it for years. Now with Sonic Reality I had the pleasure of going back to Genesis studio, The Farm, to recreate and capture these iconic drum sounds for new generations of musicians to use in their music today." The Hugh Padgham Big Fill Kit is available now for download world-wide in BFD2 (BFD3 compatible) format exclusively from http://www.esoundz.com for the launch of the product. Other format versions of the kit such as Reason 7, SampleTank 3, Kontakt and more are planned as well. A recreation of drum kit sounds in the style of other albums such as The Police Ghost In The Machine are planned with Hugh Padgham and Sonic Reality later this year. Format: BFD2 (Note: BFD2 or BFD3 by FXpansion is required to use this product). This product is a collaboration soley between Sonic Reality and Hugh Padgham. No official affiliation with any of the artists mentioned is implied. All trademarks and tradenames are the property of their respective owners.